Maggie, Faith, and Queenie are first in line for breeding this year. Queenie had two fall offs with Dallan right away, so hopes were high. However, Faith completely lost her mind and went bizzerk when I put Pirate with her. Maggie was also very confused and hesitant with Yoda. Neither Faith nor Maggie would lift, so I waited a few hours and tried again right before dark, with again no luck. I’ll try Faith & Maggie today again, with the hopes that they’ll get the hang of it. I am ready for snuggly bunnies again. Side note: Dallan in in the middle of the worst molt I’ve ever seen. 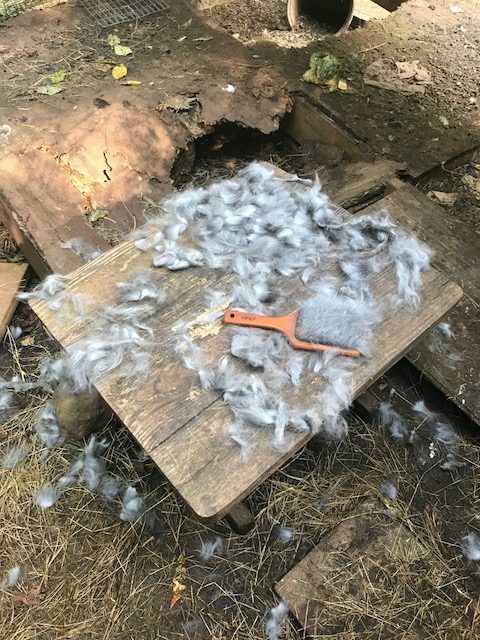 I plucked and brushed him and it looks like a rabbit exploded on the grooming table. Poor dude. Other news, the cat is missing. We gave her a flea bath and haven’t seen her since Wednesday evening. I am not hopeful for her return. Also, Bertha managed to hatch two chicks as of this morning. I’m hoping for an additional 1-2 by the time I get home. The weather has been a bit cooler and it feels great. Dove season opens next weekend & deer (archery) the following. Bring on fall!